It's that time of the year again when Sheffield's parents and students have been busy visiting Sheffield's secondary school open days as they attempt to determine the best school to apply for in the countdown to the 14th October online deadline and 31st October paper deadline. However, the school league tables can prove misleading as many of Sheffield's 38 or so secondary schools for whatever reason tend to exhibit volatility in performance from year to year. Therefore a currently high ranking school may rank lower in subsequent years i.e. by the time today's Year 7's progress to Year 11 exams. Therefore a better methodology in the ranking of schools is to evaluate performance in terms of trend. The following graph represents Sheffield's Top 18 Secondary schools out of a total of 38 rated in terms of consistency in attaining high rankings in the school league tables from 2001 to 2017 for 5 A-C GCSE Results. The graph shows schools ranked as a percentage attaining 5 GCSE's at A-C, the grading system changed for most schools in 2017 to Attainment 8 Score, so data has been normalised as a % of top scoring school. For another year the the top two rankings are taken by Independent schools, with the third being a Catholic faith school. 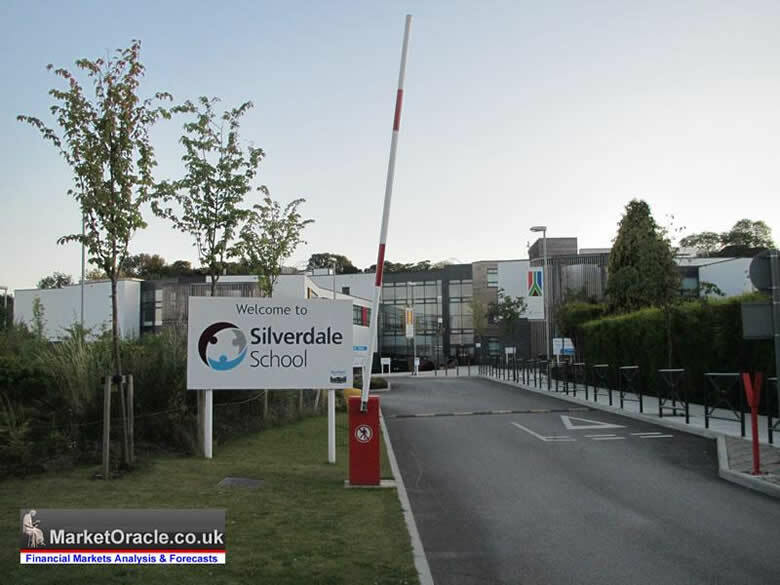 Whilst Silverdale School (Academy) continues to rank as Sheffield's best state school in terms of consistency of trend, closely followed by Westbourne and Tapton Academy despite both scoring higher than Silverdale School for 2017 but rank lower due to higher volatility in results. The next 2 state schools are High Storrs and King Ecgbert with little difference between the two. With Bradfield in 9th place which is probably the last of consistent schools. 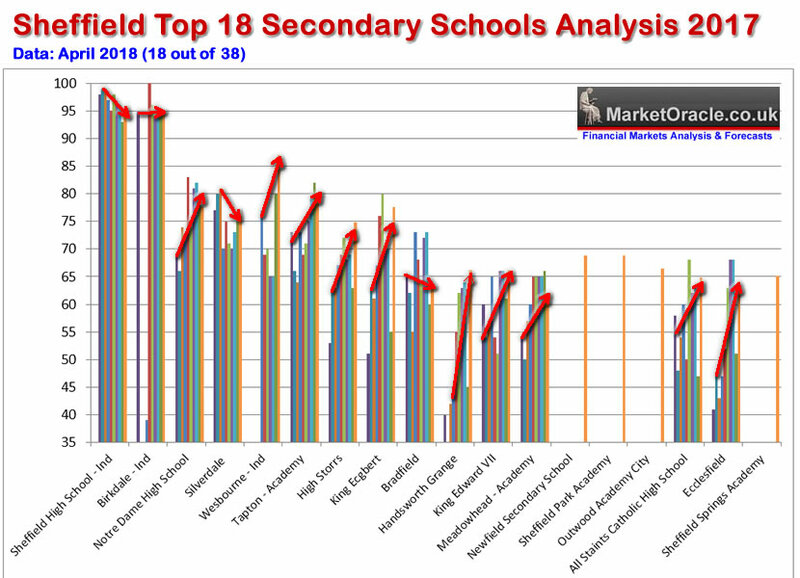 The trend chart continues with fairly similar rankings for the next 3 schools, 10th Handsworth, 11th King Edward VII and 12th Meadowhead Academy. With the remaining 6 schools all ranking similar to Meadowhead. Overall 2017 was a good year for Sheffield's school results as most managed to improve their GCSE results, with several new schools appearing on the scene as Sheffield city council finally got around to addressing the crisis in Sheffield's school places by building new schools, though of course which will lack any track record. A Fake Sheffield Best School Places Crisis? 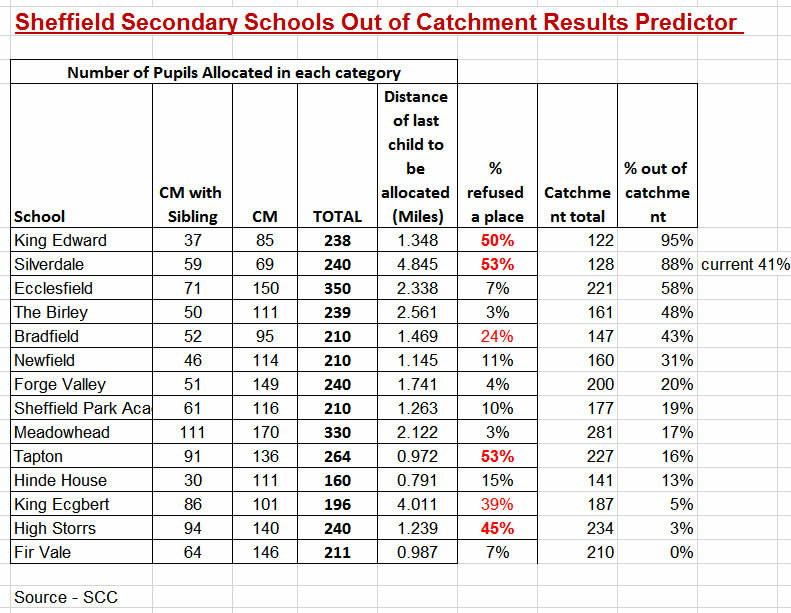 The primary determinant for a school place at Sheffield's best schools is catchment area. Though the management of academies and the council have been busy expanding schools far beyond catchment area demands so as to allow places for outside of catchment applicants as the following table illustrates. The table ranks schools in terms of how heavily over subscribed they are. And at the top of the list for another year is Silverdale School. However the table also shows that catchment area demand for Silverdale School is for only 126 places. Therefore Silverdale School is NOT oversubscribed and thus the recent expansion to 180 places was purely to dilute catchment area demand. And despite ample places to meet catchment area demand there are plans to further dilute catchment area placements by expanding Silverdale School to 240 places, which is TWICE catchment area demand that I expect will have detrimental consequences for the school as out of catchment cohorts feed through to GCSE exams. Children in Sheffield’s poorer suburbs are having to travel further to get into higher performing primary schools – while those in wealthier areas are likelier to attend one on their doorstep. The fact that so many good schools have overlapping areas of influence in the wealthiest neighbourhoods helps to explain a lot the persistent advantage in those neighbourhoods, including high house values, over time. Studies that are ignorant of the fundamental fact that it is affluent parents who are responsible for the existence of the good state schools in the first place! For if it were a question of funding then the school league tables would be in reverse order as on average affluent schools tend to receive about 1/3rd less per pupil than the schools in less affluent area schools. Instead what academics recommend and what appears to be being implemented is a recipe for disaster, one of of turning ALL of Sheffield schools into bottom ranking schools, ALL under performing, forcing affluent parents to ultimately take the leap into private schooling, leaving behind literally a city wide waste land of schools that no parents want to send their children to! Therefore good schools are good because the parents of children in affluent areas tend to spend a lot of time, money and effort on their children's education, so parents who don't do the same traipsing their children half way across the city are NOT going to reap any significant benefit, not unless they also do what the parents of affluent school children do in respect of their education. All that will happen is an erosion in the performance of the good schools results as we are already witnessing with Silverdale School. The bottom line it is NOT wise to expand places at schools much beyond catchment area demand. 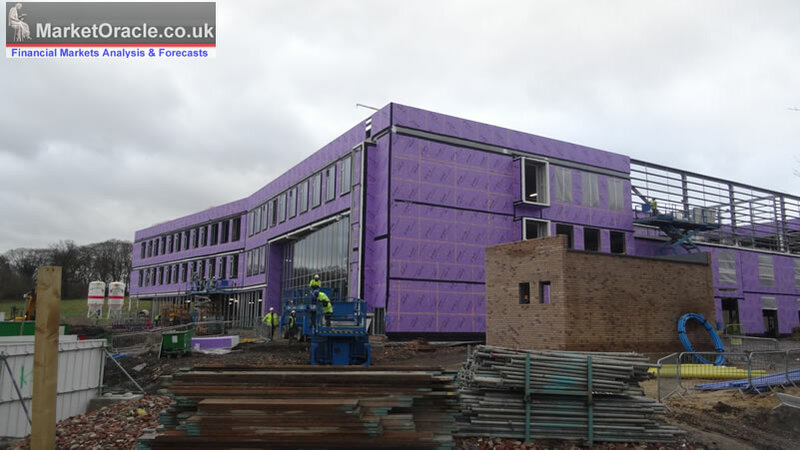 A much better solution is to build NEW schools with their own catchment areas, such as the recent construction of Mercia School on Carterknowle Road that for its first few years has a huge catchment area extending to about 1/3rd of the city. Therefore I expect all of Sheffield's best state schools with a growing intake of pupils from out of their catchment area to suffer in the results tables as a function of the % out of catchment placements as a good predictor of future results. I.e. the higher the out of catchment percentage then the greater the probability that a good ranking school will rank lower in future years as today's cohorts take their GCSE exams. King Edward's is an example of what happens when a previously higher ranking has been expanded far beyond catchment area demand that is likely to be the fate of other Best schools such as Silverdale, especially if the expansion of Silverdale to 240 places goes ahead (88%), as opposed to the present 41%. The table also predicts that Tapton, King Ecgbert and High Storrs are likely to maintain and improve their rankings, which is already apparent on the trend forecast graph. Therefore it is highly probable that all of these schools will rank higher than Silverdale School in less than 5 years time due to the rolling impact of out of catchment placements, especially if the expansion of Silverdale school to 240 places goes ahead.